In a perfect world, our vehicles would never need to be repaired. They would simply run forever, never experience any issues, and require no upkeep whatsoever. Unfortunately, we do not live in a perfect world, and our vehicles need some help sometimes. Here at Kudos Import and Performance, we want to help as many Chesterfield area residents as possible with their Lexus repair and maintenance needs. In today’s post, we wanted to discuss why proper maintenance and repair is so important for your Lexus. Continue reading below to learn more. Proper vehicle maintenance is essential in ensuring that your Lexus runs as it should. As a luxury vehicle, your Lexus is a highly tuned machine and, as such, should be given the level of care that it deserves. Below, we have listed a few reasons explaining exactly why proper maintenance is critical for your Lexus. Save Money: Although it might not always feel like it, spending money on maintenance costs for your Lexus will, in the long run, end up saving you money. Your Lexus is a lot like a person trying to stay in shape. It’s much easier to work out regularly and maintain your fitness than it is to only work out every three months and hope for the best. 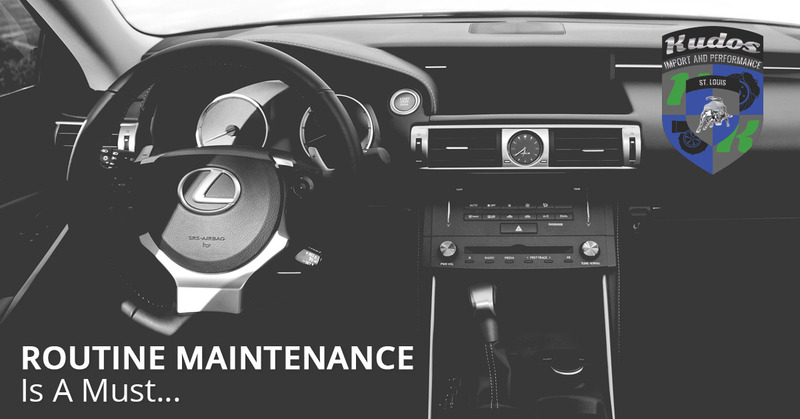 Scheduling routine maintenance for your Lexus not only keeps all of the parts of your vehicle in good working order, it also helps prevent major mechanical problems from developing. Increase Safety: Although many people don’t think about it, driving a vehicle is one of the most dangerous activities that people take part in every single day. Because people have become so used to driving, most just assume that their vehicle is always going to provide them with a safe driving experience. Unfortunately, if you don’t make sure that your vehicle is in proper repair, issues can arise that affect your overall safety. Trust us, you don’t want to find out that your brakes need some help by having them fail you in a time of need. Increase Longevity: Perhaps the most important reason to properly maintain your Lexus and complete any repairs that it may need in a timely manner, is the fact that doing so will increase the lifespan of your vehicle. If properly maintained, your Lexus can last for decades, making your investment into this luxury vehicle brand even better. While we understand that you may not expect to keep your Lexus for that long, keeping it in good repair is also a smart idea for resale purposes. If you would like to schedule a maintenance appointment or you have some repairs that you need completed, please contact us today at Kudos Import and Performance. Our expert mechanics have been helping Chesterfield area residents with their Lexus repair needs for years, and we are certain that we can handle any need that you may have. Don’t trust your Lexus to just anyone, contact us today and let us show you the difference that a luxury vehicle mechanic makes.